Glowcare are accredited and approved service agents, we have been a specialist company for Saunier Duval boiler breakdown and repair since 1992. We cover most areas in North West England, including Greater Manchester, Cheshire, Liverpool, Lancashire, and North Wales, as well as many other local towns and rural villages. 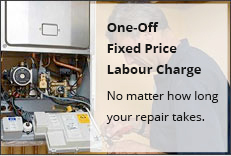 As Approved Saunier Duval Service Engineers and a Saunier Duval UK official service agency since 1992, Glowcare provides one-off, expert fixed price repairs and service, for the full range of all Saunier Duval domestic Gas boilers. These include the latest high-efficiency Saunier Duval Xeon Condens 18 & 30 & Saunier Duval Thema Condens F24E & F30E combi & system boilers. All other Saunier Duval boiler models are also serviced and maintained by ourselves. We have specialist knowledge and a thorough understanding of all aspects of these energy saving models. We carry all replacement parts for the more standard gas boilers in the range, this enables us to repair a faulty boiler in a single visit. Please view our Customer Testimonials page to see how our valued customers rate our service. To arrange a Saunier Duval boiler repair or service, call us today on 01244 880 725 or 07789 018 775, alternatively, you can use our Enquiry Form to send us an email.